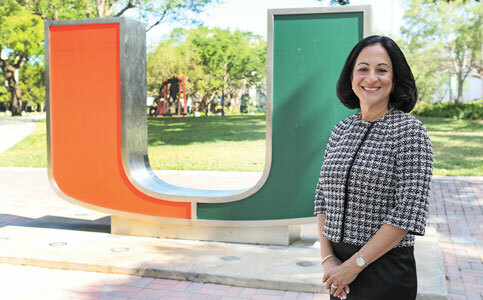 As Jacqueline Travisano closes out her first year as chief operating officer and executive vice president for business and finance at the University of Miami, the university reports it has seen major financial growth. In 2017, the university’s net assets surpassed $2 billion for the first time. Though Ms. Travisano now oversees an endowment of about $949 million and the 2017-18 budget of $3.2 billion, she says the biggest challenge she has encountered in Miami is the traffic. Years of experience in managing university finances couldn’t have prepared her for the traffic on I-95 from Broward County each morning. Ms. Travisano says she is still acclimating to Miami, assimilating the culture and exploring opportunities to get involved civically. As she learns about her new leadership team, Ms. Travisano says communication is her top priority. She says she keeps expectations clear and always provides her team with feedback to keep everyone working towards the same goals. Ms. Travisano says that she knew early on in her career that she wanted to work in higher education and she’s excited to be a Miami Hurricane. “I’ve never seen such talented students,” she says. Ms. Travisano makes a point to interact with students to collect feedback and see how her office can make their experiences better. She’s now working on increasing dining options for students and hopes to push forward the university’s housing plan. Looking into the future, Ms. Travisano says the university will be growing its STEM [science, technology, engineering and mathematics] offerings, the business program, and its hemispheric footprint. More program expansions will soon be announced, she says, along with the university’s strategic plan. Miami Today reporter Gabi Maspons interviewed Ms. Travisano in her office at the University of Miami in Coral Gables. The interview was recorded by Jahmoukie Dayle, and can be found Friday at http://bit.ly/2uNHy0Q.